Healthy chicken parmesan? It’s cheesy, saucy, crispy, and sits on top of delicious zucchini noodles. Greetings from Minnesota in May on a Monday Morning! Hi, friends! It’s Monday after a beautiful, brunch-filled weekend celebrating All The Mothers and we’re going to start talking about this cheesy, saucy, super-delicious family-loves-it chicken in T-3 seconds. Because seriously, there can NOT be much waiting. I NEED THE CHICKEN PARM. But first, I just need you to know that yesterday I went ahead and celebrated myself for being Sage’s mom. Two extra pieces of cake, a long nap with Sage, and a good long binge on Instagram. I am just that honorable of a person that I couldn’t let the day go by without some deep self-recognition. I mean, who else forgets to feed her, makes her participate in my SnapChat recipe videos, stuffs her with treats after doing one tiny trick (“Sage, SIT. No, SIT. Over here. Come on, SIT.”), and gets her all riled up for no reason other than to laugh and take pictures and then give more treats? Badge of motherly honor right there. But enough about adventures in dog parenthood. The thing I’m somehow trying to say is actually just this right here —> I want you to have this great recipe for cheesy, saucy, crispy, healthy chicken parmesan! It can be ready in about 20 minutes with very minimal prep, it only requires 7 simple ingredients, and it’s healthy. Meaning: let’s just acknowledge that for many of us, this is real-food focused and veg-friendly enough (that’s zucchini on that plate!) to feel like a good, solid, wholesome Monday dinner with protein and veggies annnnd also still cheesy and saucy and golden brown crispy enough to still be delicious. I mean, dats just how we rollll. Okay, big announcement here, guys. I NOW USE A SPIRALIZER. That’s right. I’m jumping on the bandwagon of the internet and making those fake-out noodles out of zucchini that people call Zoodles. Only I feel really obnoxious actually calling them Zoodles, so I just call them… well, I don’t call them anything. I just eat them because they are really surprisingly delicious. Wait tho I am a REAL noodle lover and I just confessed to you that I would eat zucchini cut into noodle shapes instead. WHAT. Things are getting out of control. Someone bring me back into the light. Truthfully, even though my loyalties ultimately stand with real noodle-noodles, I’ve been playing around with a few different types of spiralizers (aka machines that make vegetables into noodle shapes) as I try to determine which, if any, I would actually be willing to add to my intentionally slim kitchen appliance list AND recommend to readers. Which is kind of what I expected. Everyone told me that they love it and it’s the best of all the spiralizers and it has, like, 5,000 something 5-star reviews. 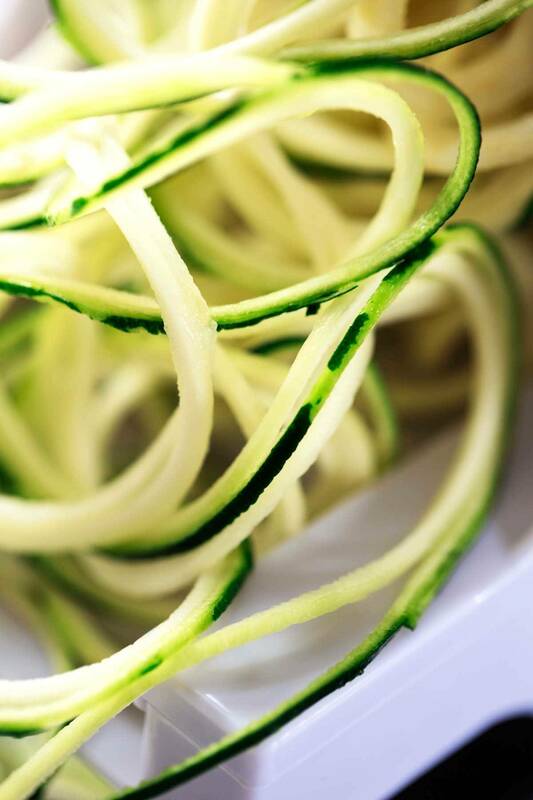 If you have absolutely no interest in a spiralizer but still want to try this recipe, fear not. You have a few options. Cut your zucchini into thin, thin strips with a knife, or a mandoline, or a food processor attachment, and that should work just fine. Also, if you have any types of spiralizers that you think I MUST try, then you MUST COMMENT. ♡ I will make you this chicken and ship it to you, er, no, like, just eat it in your honor. Parting words: I promise this doesn’t take more than 20-30 minutes, start to finish. You don’t need a bajillion bowls or pans or ingredients. It’s the kind of meal you crave on a Monday night. It’s crispy, saucy, cheese-topped chicken served over a bed of yummy vegetables aka zoo…. ugh. Can’t say it. PS. Big love to my bestie Ang for sending me a snap of recent chicken parm creation and inspiring this easy, healthy Chicken Parmesan into a blog post! Friends who love food are the best kind of friends. Healthy Chicken Parmesan that is crispy, cheesy, saucy, and served over zucchini noodles. So easy and extremely delicious! Fry: Cut the chicken breasts into a total of four pieces (for example, if there are two breasts, cut each in half – pound them a little thinner and wider if you want) and dredge the chicken in the breadcrumbs so that they stick all over the surface of the chicken. Add the chicken to the hot skillet and fry for 3-4 minutes on each side. You want the outside to be golden brown – the inside can finish cooking in the oven. Also, if you really want the chicken to stay crispy, heat the sauce separately and add it over everything at the end. The chicken loses a little crispy exterior as it bakes in the sauce – I didn’t mind it, but just something to think about if you want the crispy chicken. This looks so good! I love chicken recipes. I’m excited to try your version of it with this Vodka tomato sauce! 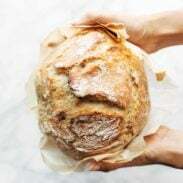 You’ve blown me away with this recipe! I love chix parm but don’t indulge too often cause it’s not all that good for you. And there were 3 things I asked for for Mother’s Day 1.) A spiralizer 2.) a venus fly trap or 3) a bonsai tree. And it was a no-go on all 3! I second Melissa! Go buy yourself a few things… especially that bonsai tree! We use our spiralizer all the time! The ribbon spiral is my favorite shape. It just makes everything look beautiful and healthy. We love it! Perfect! Hope you like this one Joe! It looks delicious. I don’t have a spiralizer, I will try with a julliene cutter. I actually have all the ingredients at home (homemade tomato sauce). Chicken Parm is MY FAVE! What a great way to start the week, Lindsay! Yum!! So… no lie I just made my dinner menu for the week and chicken parm is on the list so this post is perfect timing! I want a spiralizer so bad but I don’t know if I’ll be able to get my husband to eat zucchini instead of pasta… we shall see! Hey! Fur baby mommies count just as much as human baby mommies 😉 I am also a spiralizer convert and I looooove it! I love this combo of the zucchini noodles and the chicken parm! Thanks for sharing! I can never resist chicken parmesan and I love how simple you’ve made it. Perfection! Gorgeous photographs, the colours work together beautifully! You know what they say about eating with your eyes first? I never realised before how true that is!! Chicken and sauce and cheese together? (oh, okay…and vegetables…) – Yes, please! Pinned! Thanks for the spiralizer recommendation! I’ve been lusting after them for a while but have been waiting for a solid choice. This looks so colorful and festive! Great ideas going on here! Yeah – I’ve tried a few different styles and this one just seems to be the easiest to use! Good luck! Yes to everything that’s in this dish! The color contrast, the texture of these veggie noodles, and the crispy chicken parmesan!I’m gonna have to make this sometime soon! Thanks Felicia! hope you like it! I will probably just use my food processor. My kitchen is definitely larger than my last but that just means every kitchen gadget that was stored in the garage is now in my kitchen. Not a lot of room for many more gadgets. This Chicken Parm looks really good. Great job. I LOOOOOOVE the food processor! 🙂 Great idea. chicken parmesan in 20 minutes? You’ve officially won me over! Yum. So when you say cut the chicken into 4 pieces, do you mean cut each chicken breast into 4 pieces? And then pound if we want? So, each person will end up with 4 pieces of the chicken? That’s a good question Alex – usually when I buy a pound, it will have 2-3 chicken breasts, but since this recipe is supposed to serve 4, I was just saying cut the total amount of chicken into four pieces. Does that make sense? I’ll clarify in the recipe. It’s not even 10am here and I am dreaming of chicken parm. Bought a little mini spiralizer months ago and still havent used it. I felt like buying it was the first stage in joining the zoodle crew. Now I’m just waiting for a reason to fully commit. Welllll I gots it right here. Nom. Awesome! Here’s your reason to commit! 🙂 Enjoy, Melissa! I’ve always said I never wanted to try veggies made into noodles – but considering how much I respect your opinion – I’m thinking….. maybe. 🙂 Looks delicious! I actually really do like it. And I’m saying that as a noodle (real noodle) lover. !!! Hey all good puppy-moms NEED to do some spoiling so toss him ALL the treats – though, am thinking he might do a back flip and bring y’all the newspapers and even fix yalls coffee if yall gave him some of this! I don’t make Chicken parm often because of the time – but this 20 minute version is a gotta try! Thanks Shashi! Hope you like it! I’ve been on a mission to eat more veggies so this is a perfect option! As always, your photos are beautiful – Pinned!! Yep! I’m on the train. This looks delish! We’ve been searching for a good spiralizer – now we know which one to go with! Thanks Lindsey! Do you think I could use turkey breast fillets in place of chicken? I need to use them up, and would love to make this, but don’t want to drasatically change to taste of the dish. Yes, I do! I don’t usually use turkey so it’s hard to say how the taste might be different but I think the recipe itself should still turn out fine. 🙂 Yummy. Zoodles! ha that name always brings me back to the Alpha-Ghetti! Yes indeed! Practice makes delicious. Er, perfect. Er, whatever.